Since we're still in the getting to know you phase, I'd like to share the inspiration behind the incredible blog design that Brianna at Sparkle Out Loud created for me. I probably will mention her a million times, since I'm head-over-heels for this blog design, but you can't deny - that girl's got talent. Restating the obvious from my first post, since he coined the acronym LUMUHAND, the title of this blog is no doubt inspired by my sweet Grandad. The anchor comes from my love of all things nautical and being a Navy brat, for 26 of my 28 years in existence. While I support all of our servicemen and women, across the branches, my heart will forever cheer Go Navy. Beat Army! Especially since both my dad and my brother are Naval Academy grads. The sparkle, well... I love sparkly things.. the gold and peach, comes from my obsession with the glamour of the Gatsby era. I literally told Brianna that I wanted my blog to be the essence of "Nautical Chic meets Gatsby Glam." Now, the compass (and one of my favorite design elements of the blog) is inspired by the most meaningful gift I've ever received. While I'm incredibly thankful and appreciative for some AMAZING gifts I've received in my life (Thank you, Mom and Dad for my undergrad college education, my 21st birthday right hand diamond ring and a pair of round diamond solitaires for graduation) my Grandad's DIY style gift, is by leaps and bounds, the most meaningful gift I've ever received. Disclaimer: Please don't be alarmed by what looks like skin that needs some serious moisture therapy. I can assure you that it's only the embossed filter used to make the engraving message pop. 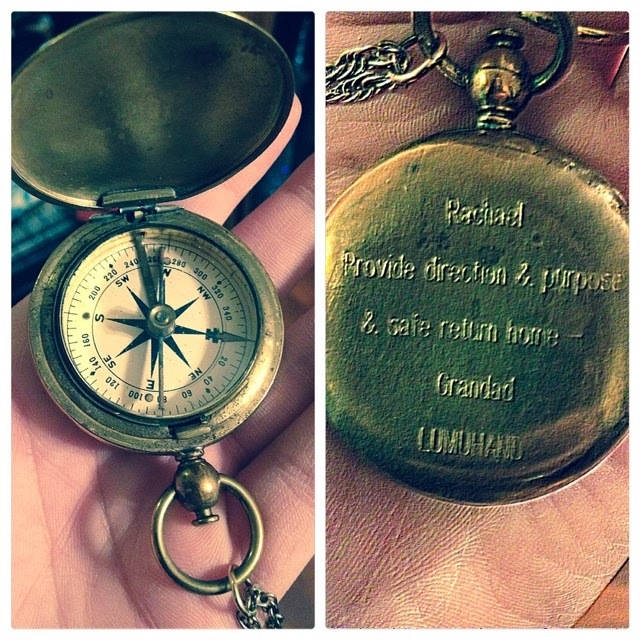 I can't quite put it in to words, but when I hold this compass, I feel my Grandad's hand. Polishing the compass, he spent hours holding it and when I do the same, I can't help but feel him with me. The chain length makes the compass hit at heart level and I can't help but wonder, if my sweet Grandad did this on purpose - He lives on in my heart. When I rub my thumb over the inscription on the back, I think about him doing the same and the heartfelt message catches my breath - every time. Some days, like tonight, the message is hard to read. I miss him so much. What's the most meaningful gift you've ever received? Anyway, I love the gift and inscription!! Dad was c/o 82' (He was a submariner, too!) and the Bro was c/o '05. At some point, with or without your future Navy brats, you MUST go to the Army/Navy game (if you haven't been yet!) Greatest event experience EVER!